My 12th marathon in Mumbai on 15th January 2017 was a race of two contrasting parts. Till the 30Km mark I ran a strong and steady race at an average pace of 5:19/Km - hitting the half way mark about 30 seconds later than my target of 1:51:30. 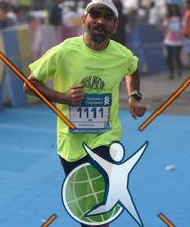 Though sub 3:45 looked tough finishing around the time of SCMM 2016 (3:47:15) seemed feasible. However, things went downhill soon after specially in the last 5 Kms. After the 30th Km I clocked over 5:25 in every Km after with the slowest of 6:05 on the Peddar road flyover (Km 36). As the average race pace dropped with each Km, the left calf and sole felt heavier and both the physical and mental resolve took a tumble. Pace of 5:46, 5:57,5:50,5:50 in Kms 38 thru 41 meant that even sub 3:50 looked challenging. That thought gave me a fillip to push harder for the remaining 1200m. The race clock crossed 3:50 as I turned the corner on Fort. Thankfully, I managed to sprint the last few hundred meters to cross the finish line in 3:49:54 - mixed with relief, fatigue, disappointment and a bit of nausea. The detailed results are here. In retrospect, not sure what to blame for this skewed performance. Certainly not the weather. At 20c it was warmer and a bit more humid than expected. However, it was partly cloudy till the finish time which meant even on marine drive there was no direct sun. Inadequate training and poor muscle strength resulting in piriformis syndrome are of course the culprits. In hindsight I should have probably targeted 3:47 and maybe run the 1st half a minute or so slower. The moderate pace runs post the marathon have shown that the left side is very weak. In 2017 need to focus on strength training and stay injury free in order to meet the sub 3:45 target in SCMM 2018. And not to make the mistake of over training ever again. On Saturday night I went to bed at 9:45 after a light dinner of idlis and lemon sevai at Madras cafe . Woke up at 3am with the alarm. Like the last few years I got picked up outside Acharya Nagar by AJ's father around 3:55am. 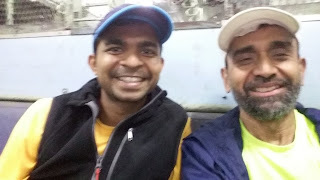 We were in Chembur station platform at 4:05. There was a minor anxiety as the timing of the train to CST was not clear,. However, around 4:15 the train showed up taking us to CST by 4:50. The buzz and energy levels at CST on a marathon morning is a unique feature of SCMM that I thoroughly relish and cherish. It's difficult for someone who has not experienced it to relate to. The entry into Azad maidan (there were separate Qs for those with and without bags) and check-in at baggage counter(where we bumped into D) was smooth. I lost AJ and D when I went to take a leak. By about 5:30 I was among the runners crowding the holding area. Met Satish here but lost him on the way to Coral A. The start was chaotic - runners were let out of the holding area a bit late and scrambled towards their corals. Coral A (for sub 4 runners) seemed very crowded. I could cross the start line only a minute after the race had begun. Vishy, Pankaj and Shilpy started around the same time and pulled ahead. I was quite appalled to see the 4:15 pacer ahead of me around the 3Km mark. While pacing is still at a nascent stage in India, the organisers and the pacer co-ordinators need to realise that not every runner is cut out to pace and must have a stringent screening criteria apart from just past race finish times. On the other hand the 3:45 pacer seemed to be doing a good job running at a fairly steady pace a couple of seconds faster than the required average pace. I mostly ran alone though alongside Ankitha and her pacer till about 10Km mark when she pulled out. Around the 8Km mark on the Peddar road stretch I overtook Pankaj. And went past Vishy in the Peddar road stretch on the return. (Shilpy ran a very strong race like several other friends - Sid, Pani, Bobby, Neera, Nirupaman.. and earned a place on the podium ). Though Satish and I finished a few seconds of each other we never saw each other on the route or in the finish area. Overall for me the 1st half was very enjoyable and the last 10Km was a real struggle. Thankfully, this time the finishers did not have to climb steps to get into Azad maidan. 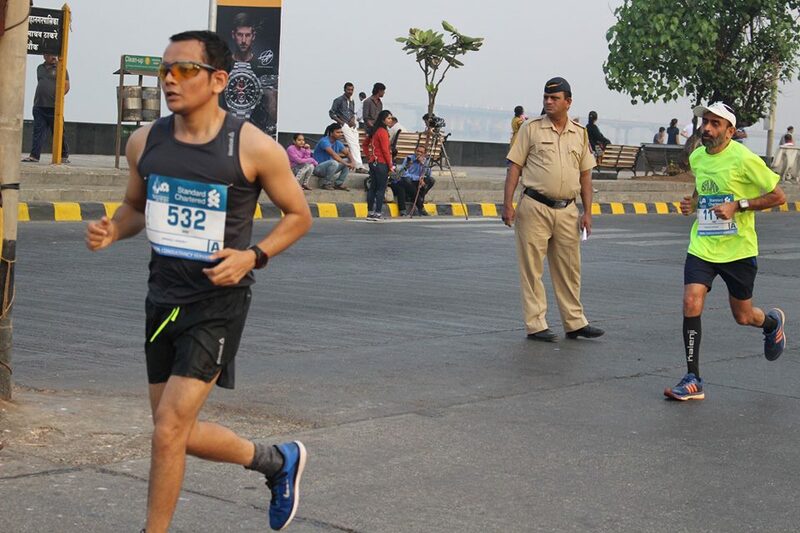 After collecting my bag , the medal and refreshments and greeting a few runner friends I headed back towards VT station as I was mentally too jaded to hang around in Azad maidan. Due to the Sunday 'mega block' got a train only up to Kurla and then took a Uber to Govandi to get home by 1230. The Indigo flight to Bangalore that evening was full of runners analyzing their runs and the ifs and buts. At that I felt that maybe I needed to take some time off and even skip Auroville. Now that the race is a week away my plan A is to run an easy first half (57m) and then depending on how the left side feels finish between 1:54 and 2 hrs. Plan B is to take it really easy and finish around 2:15. Will probably decide only on race morning.